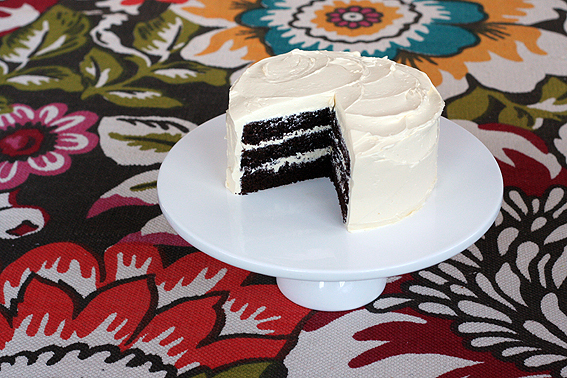 My fascination with layer cakes continues, this time it’s a chocolate cake. I made this cake for no other reason than just to make a cake. With all the sewing and crochet projects I have going on, sometimes it’s nice to start something and finish it a few hours later. This is the second time I’ve made Swiss meringue buttercream frosting and I’m happy to report all went well. After I added half the butter (the amount of butter in this recipe is crazy, try not to think about it for too long) to the egg white and sugar mixture, I popped the whole bowl in the fridge for a few minutes. I was worried the mixture was too soupy and I’d read cooling the mixture would help this. It worked like a charm! I added the rest of the butter and let the KitchenAid mix away. It was only afterwards that I realised I was supposed to change the whisk attachment to the paddle. It looks like no harm done though; the frosting was fluffy and dense and easy to spread. I couldn’t decide whether to colour the icing but after reading about people having trouble mixing Wilton gel food colouring and Swiss meringue buttercream, I decided against it. 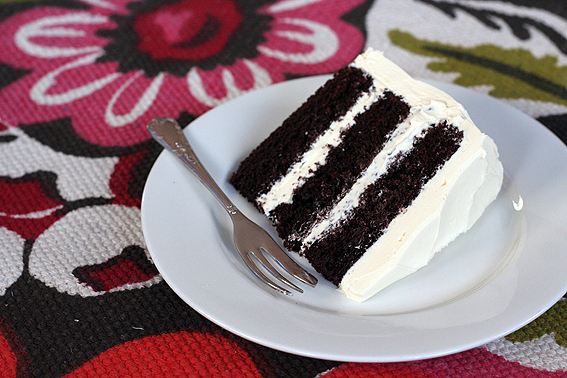 I quite like the dark cake against the white frosting. I think the next cake I make will be pink, a pink layer cake. Perhaps gluten free. Wish me luck with that one! wow, your layers look perfect! this looks so, so great. Yum! That looks too good to eat! My mouth is watering just looking at it.